Pioneers of Leningrad in a defense drill, 1937. 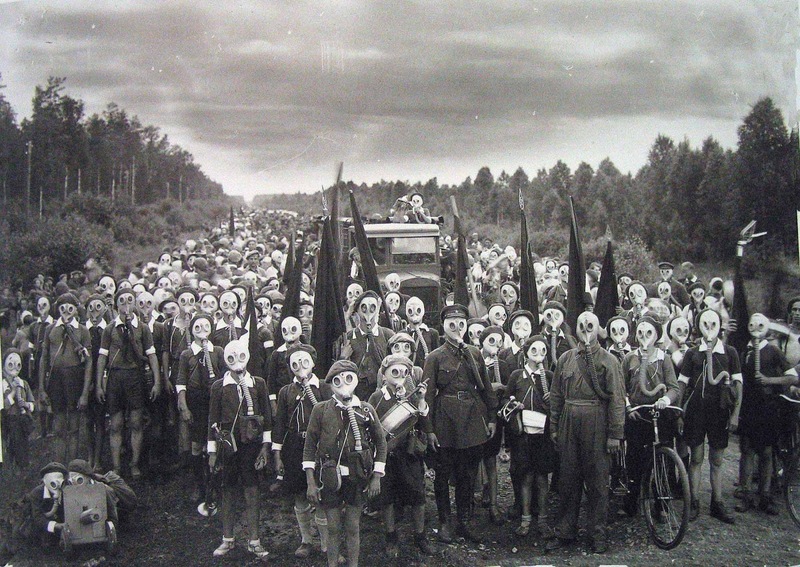 Viktor Bulla’s photograph of hundreds of children wearing gas masks was not meant to be ghoulish, a commentary on war or lost innocence, but rather exemplified a reason for pride — the country was blessed with well-trained, well-equipped and obviously courageous young fighters. The picture dates from 1937, four years before the Siege of Leningrad, and that makes the weirdness vivid and poignant. So many of the children here would have died in the Siege, or lived through it in the civil defense force, eating wallpaper paste and digging trenches. How brave and ready they must have felt in 1937, though. The Pioneer Organization was a mass youth organization of the Soviet Union for children of age 10–15 that existed between 1922 and 1991. Similar to the Scouting organizations of the Western world, Pioneers learned skills of social cooperation and attended publicly funded summer camps. By the middle of 1923 it had 75,000 members, 161,000 in the beginning of 1924, 2 million in 1926, 13.9 million in 1940, and 25 million in 1974. During the Great Patriotic War the Pioneers worked hard to contribute to the war effort at all costs. Thousands of them died in battles as military personnel and in the resistance against Nazi Germany in its occupied territories as partisans and Pioneers under secrecy in enemy-occupied towns and cities, even in concentration camps. Four Pioneers would later receive the coveted Gold Star Medal as Heroes of the Soviet Union, and countless others were awarded various state orders, decorations and medals for acts of bravery and courage in the battlefield, on enemy lines and occupied territories. The battle of Leningrad was one massive killing spree. Hard fought by both sides, including the civilians. Between here and Stalingrad, look at the deaths, this is what war looks like, not some romantic pleasure trip.